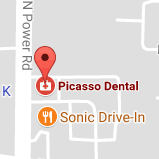 Welcome to the Mesa, AZ (Arizona) office of Picasso Dental, where our staff is dedicated to leading-edge dentistry in a caring, warm environment. Our dental professionals, Dr. Mark Anthony and Dr. Tyrel T. Beavers provide dental care for children, teens, adults, seniors, and everybody in between. We couldn’t be more proud of the reputation we have gained, which is proven by the long distances some of our patients travel for treatment. The expertise of our doctors and the years of experience that everyone in the office has gained have made us what we are today! We are dedicated to going the extra mile for each one of our patients; we all find that that the relationships we have made with our patients throughout their care has been extremely rewarding. Our mission is to always watch out for our patients’ best interest. We are excited to announce the American Society of Implant and Reconstructive Dentistry (ASIRD) has selected us as the top implant team in our area! The Society limits membership to one implant team in each geographic region and membership is by invitation only - we are thrilled to accept this honor, and to continue to provide exceptional implant services to our patients. Don’t wait any longer to get the oral care that you deserve! Call us today for a consultation for yourself or a loved one.